USF will take on Marshall in the Bad Boy Mowers Gasparilla Bowl Dec. 20 in Tampa. While five Florida universities are going to football bowl games this year, perhaps the bigger story is their collective missed opportunities. The University of South Florida, which started the season 7-0 before losing their last five games, will make their fourth straight bowl appearance when they play Marshall (8-4) in the Bad Boy Mowers Gasparilla Bowl Thursday, Dec. 20 at 8 p.m.
USF at least has home field advantage, as they’ll play in Tampa's Raymond James Stadium, their home stadium. The game will be televised on ESPN. USF Athletics announced that the first 1,000 students to purchase bowl tickets will be able to do so at a discounted price of $10.00 in honor of the Bulls’ 10th bowl game. In addition, season ticket holders who renew their tickets for the 2019 season before Dec. 15 will receive two tickets to the game. The University of Central Florida (12-0), which wrapped up its second straight undefeated regular season with a come-from-behind 56-41 victory over Memphis in the American Athletic Conference Championship game Saturday, will once again not be one of the four teams taking part in the Collee Football Playoff. Instead, they’ll play LSU (9-3) in the Playstation Fiesta Bowl in Tempe, AZ, on Jan. 1, 2019. "I'm not sitting in that (NCAA playoff selection committee) room, so I don't know what else this program needs to do," UCF coach Josh Heupel told ESPN. "We're going to continue to compete at a high level and continue to go play football games, and hopefully win a bunch of them." Number 2 Clemson (13-0, ACC Champions) will play Number 3 Notre Dame (12-0) in the Goodyear Cotton Bowl Classic in Texas Dec. 29, while Number 1 Alabama (13-0, SEC Champs) will take on Number 4 Oklahoma (12-1, Big 12 Champs) in the Capital One Orange Bowl in Miami Gardens that night. The winners of those two games will meet for the National Championship on Jan. 7, 2019 in Santa Clara, California. Other state schools participating in bowl games include the University of Florida (9-3), which will take on Michigan (10-2) in the Chick-fil-A Peach Bowl Dec. 29 in Atlanta; Miami (7-5), which plays Wisconsin (7-5) in the New Era Pinstripe Bowl in New York City, Dec. 27; and Florida International (8-4), which plays Toledo (7-5) in the Makers Wanted Bahamas Bowl Dec. 21 in Nassau. Florida State University will not play in a bowl game, the first time that’s happened since 1981. The Seminoles went 5-7 in former USF head coach Willie Taggert’s first season in Tallahassee. There will be eight bowl games played in Florida, from Tulane vs. Louisiana in the AutoNation Cure Bowl in Orlando Dec. 15 through Kentucky vs. Penn State in the VRBO Citrus Bowl, also in Orlando, on Jan. 1, 2019. Mississippi State and Iowa will play in the Outback Bowl at Raymond James at noon on New Year’s Day. 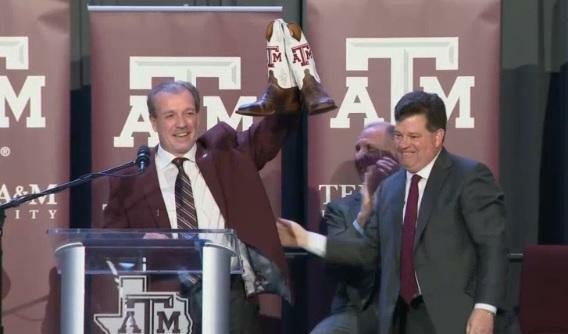 Former Florida State University football coach Jimbo Fisher says accepting a job at Texas A&M University was a no-brainer. He issued his first statement Monday after splitting from FSU last week.